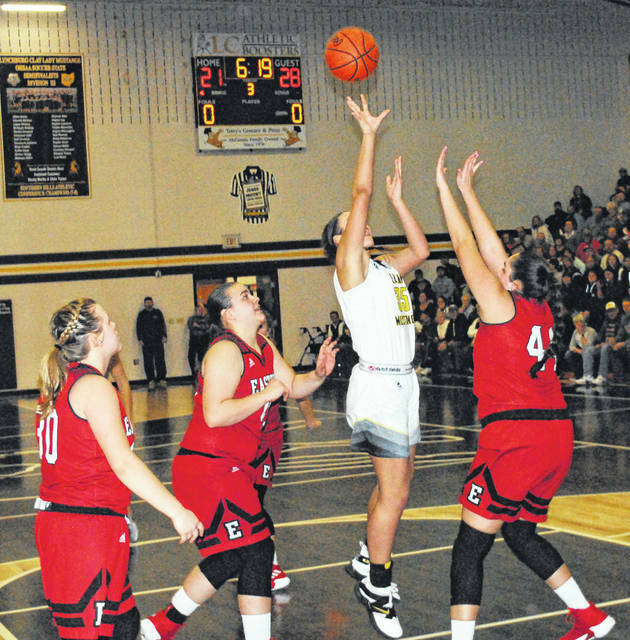 Lynchburg-Clay senior Peyton Scott elevates over two Eastern defenders on Monday at Lynchburg-CLay High School where the Lady Mustangs hosted the Lady Warriors in a matchup of the top two teams in the SHAC. Logan Binkley of Lynchburg-Clay attempts a shot over Eastern’s Alexa Pennignton on Monday at Lynchburg-Clay High School. DODSONVILLE – A capacity crowd at Lynchburg-Clay High School witnessed a Southern Hills Athletic Conference clash between the home-standing Lady Mustangs the the visiting Eastern Lady Warriors. Lynchburg-Clay led after the first quarter but were unable to maintain the advantage as they fell to the visitors 42-41 when Zoe Fittro’s three pointer was blocked as the final buzzer sounded. Peyton Scott led the Lady Mustangs with 26 points on the night and recorded her 2000th career point at the 3:21 mark of the second quarter. Lynchburg-Clay trailed 33-31 after three quarters of play and Scott had 24 of the Lady Mustangs 31 and looked poised to finish off the second half comeback. However, the Lady Warriors sent three defenders at her in the fourth quarter and forced her to become a passer while limiting her two just two points, at the charity stripe, in the final period. Scott found fellow senior Chelsea Hart open under the basket on several occasions and Hart netted six points in the quarter but it was not enough for the Lady Mustangs. The Lady Warriors nearly cost themselves the game at the free throw line when they failed to convert the front end of consecutive one and one opportunities. But Eastern’s defense held strong and Fittro’s potential game winning shot fell short at the Lady Warriors emerged with the 42-41 win. Lynchburg-Clay came out of the gate firing on all cylinders against Eastern as Scott recorded 10 points in the first quarter and the Lady Mustangs were able to hold the visitors to just six points in the first to take an 11-6 lead after one. 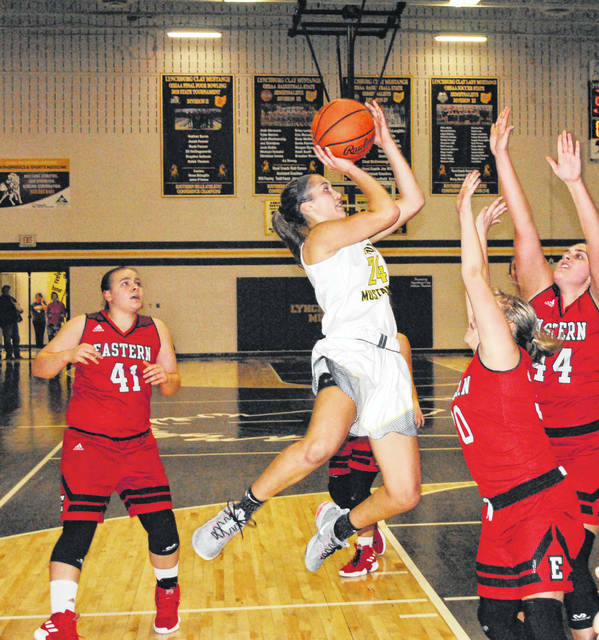 Eastern found their rhythm in the second quarter as they netted 18 points while limiting the Lady Mustangs to 10 in the quarter and took a 24-21 lead at halftime when Juanita Frost hit a three pointer shortly before the buzzer. LC outscored Eastern 10-9 in the third quarter as Scott had six of her team’s points and helped set up the thrilling fourth quarter with a pull up jumper with 1:17 to play in the third to bring the score to 33-31 where it would stay for the remainder of the period. The Lady Mustangs will have three days off before traveling to Fayetteville on Thursday, February 7, to take on the Lady Rockets in SHAC play. The recent girls tournament draw saw the Lady Mustangs receive the second seed in their bracket and they will take on Portsmouth West on Wednesday, February 13, at Valley High School with a scheduled tip time of 6:15 p.m.